Or a combination of all of these things. Scroll down for more information on how we can support you with any of these along with frequently asked questions. Sign up for our care newsletter to hear more and receive our 6 Step Guide To Perfect Staff Induction. Our Care Sector report has been benchmarked against high performing care workers and has enabled us to create a concise, easy to use report that comes with interview questions to help guide the conversation. As the assessment only takes around fifteen minutes to complete, and reports are instantly generated, it is a popular choice for care companies looking to identify the right people for the job, particularly when they have a history of poor staff turnover. The Judgement Index allows interviewers to be more objective and helps to standardise recruitment practices across multiple managers and locations. “We have been using the Judgement Index as part of our overall recruitment strategy which has shown positive results in the calibre and values of the candidates we have employed. 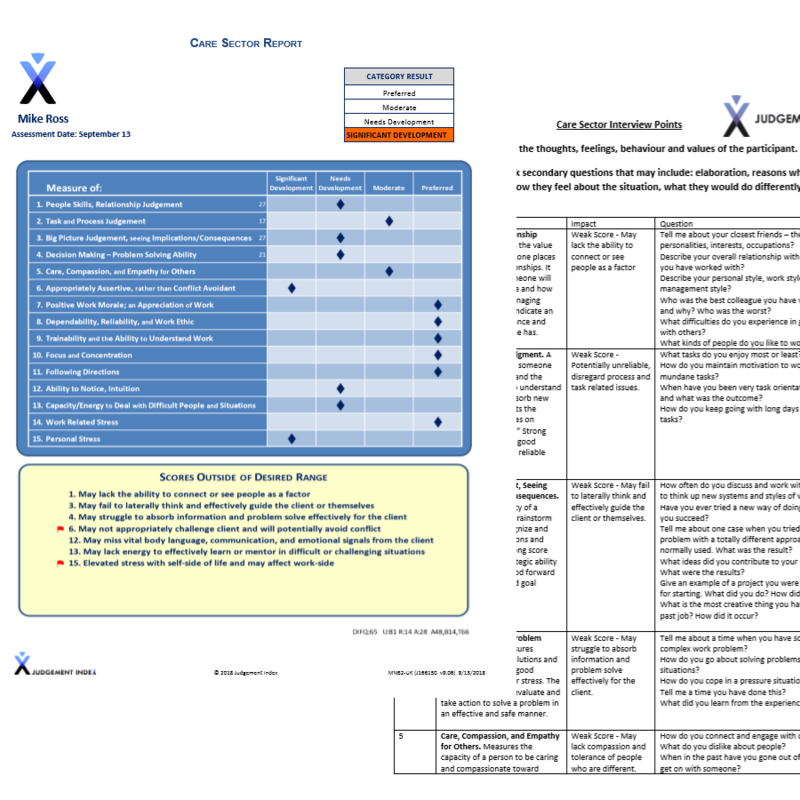 We are using this tool proactively to assist in assessing all other staff across the organisation to identify training and support needs to ensure we all work towards the company goals and values. Our Leadership Academies and workshops range from half a day up to a ten day leadership course and we have over 20+ modules which can be adapted for your team’s needs. 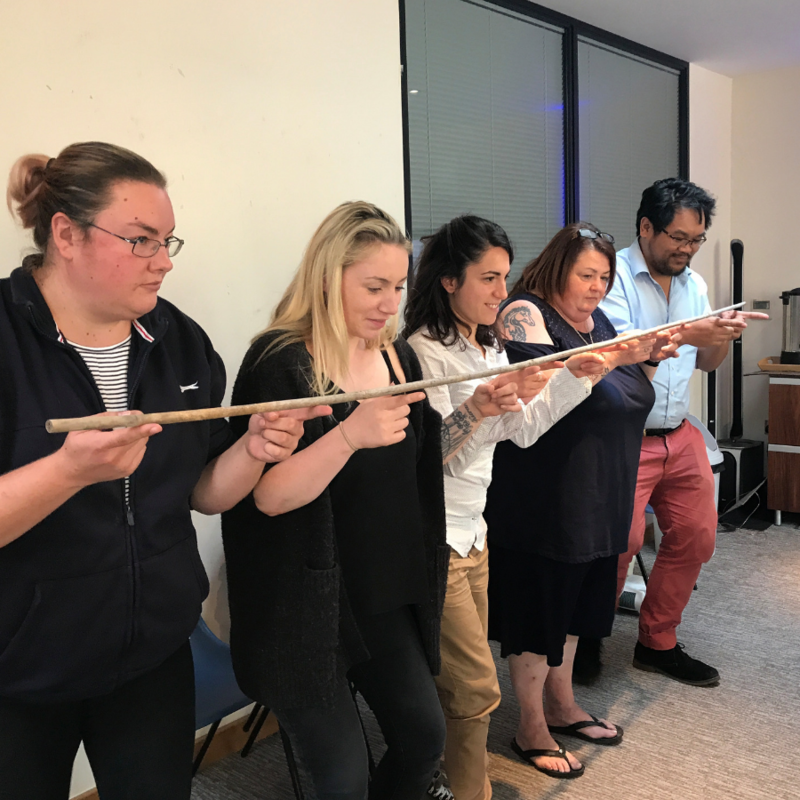 Our training is interactive and practical, delivering leadership techniques and models that the delegates can go back and put into practice immediately. Click here to download a copy of our Leadership Academy Brochure which gives an example of a five-day academy along with case studies. 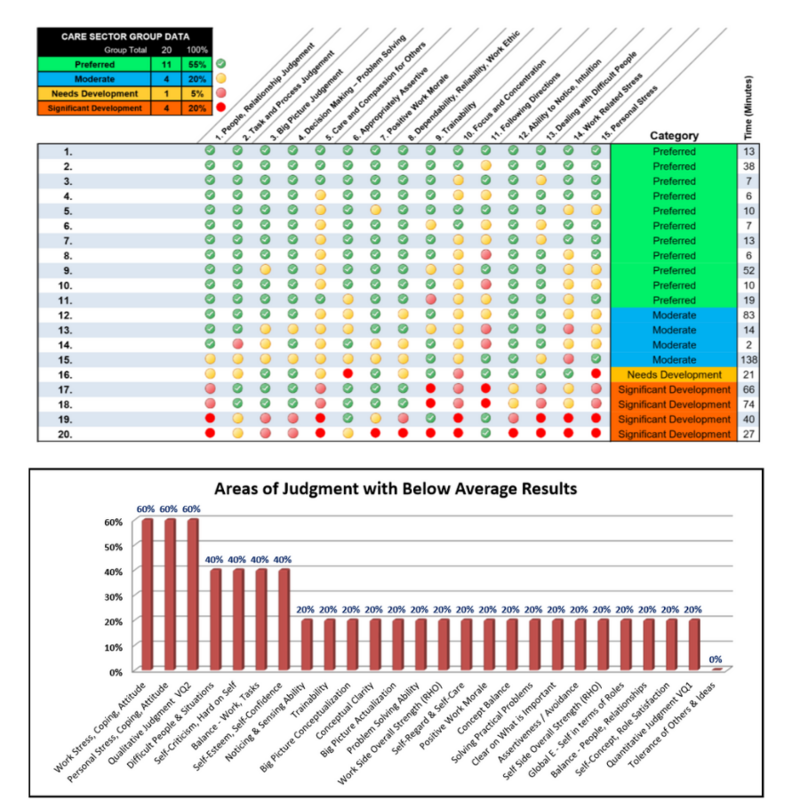 By using the Judgement Index assessment with existing staff members, we are able to produce team reports which can highlight collective development areas, enabling you to target your training more effectively. You will also see who in your team match the qualities of successful leaders in care and who is more likely to be a compliance risk meaning you can focus your management efforts where they are needed. The Care Sector Report is also an incredibly useful tool during the appraisal process, as it allows a more meaningful conversation around strengths and development areas. Our clients are trained to pick out key areas of the report to discuss during appraisals and set actionable goals which can be measured the following year. Sign up for our care newsletter to hear more about future events, workshops and useful resources and receive our 6 Step Guide To Perfect Staff Induction when you sign up! What makes the JI different from other assessments used in care? Some organisations have introduced psychometric tests or rely on the NHS values based interview questions, but as these are self reporting (that is the candidate is asked to describe themselves as true or false to a scenario) they can easily be manipulated to get the desired result, and just don’t go deep enough to uncover what’s “behind the mask”. Because of the abstract nature of the Judgement Index, it is not possible to manipulate, and because of our research, we can more accurately predict success in care than any other assessment. In addition to that, most other assessments are personality based and come from a derivative of Jung Theory, which has formed such assessments as Myers Briggs, DISC, PPI etc. Whilst these are heavily used in corporate businesses they have relatively low validity and reliability in predicting success. The Judgement Index is derived from the science of value, known as Axiology, and specifically from the research of Dr Robert Hartman who was nominated for a Nobel Prize for his work in this field. It is validated and proven to be more reliable in predicting success than any psychometric assessment. Why use an assessment during recruitment? The reason why the Judgement Index has such strong results within this sector is because most rely on a selection process that just isn’t thorough enough. CV, referencing, mandatory check and interview do not uncover true values & often an unsuitable candidate can slip through the net. The associated risks are not just the impact on the team & the cost to replace that candidate, but the risk to brand should an incident occur. The Judgement Index should not be used solely to make a decision, but can help an interviewer to be more objective, and can highlight any risk factors should they wish to hire someone with significant development areas. We offer a few different options and will work with you to find the right solution for your business. Pay As You Go – The Care Sector Report is available on an ad hoc basis for £35+vat per report. Subscription – Most of our clients opt for a subscription package which is calculated based on some information from you. With a subscription, clients have unlimited report use, so they are able to use the JI for every person within the business and for interviewing prospective new staff. They also have access to team reports when needed and more in-depth reporting for senior hires. As an example an average client would expect to pay around £10-15 per report on a subscription package but it is charged as one monthly charge. Training – All clients must be trained before using the Judgement Index and following that they gain access to our online training portal, monthly webinars, post-training resources and support in using the assessment. We also supply information on evidencing the JI for CQC, templates for appraisals and discounts on further training. With almost company we visit, we only need to save a few wrong hires a year for the JI to deliver a return on investment. Does the assessment support diversity? Many companies in the UK are conscious that their recruitment practices do not discriminate and the Judgement Index supports this. In the US there are strict criteria set by the Equal Opportunities Employment Opportunity Commission, which means that any assessment used during a recruitment process should be proven to be free from bias against any gender, ethnicity, religion or race. The JI has passed this criteria. We also recommend that the JI contributes around 30% to your overall hiring decisions, and never advice “don’t hire” or “hire” in our training based purely on the report alone. The JI is designed to provoke further questions to help you make a more objective decision. If you’re interested in taking a close look then why not let us bring the JI to life for you? Give us a call on 0800 8101025 or use the contact page on this website to send us a message. We can discuss your challenges and how we might support you with those. We are not sales people and you won’t get any pushy talk from us! It’s just not in our values. We will be happy to share more with you and suggest a package to suit your goals. If you want to have a bit more of a nosy then feel free to download some of our research from the top of this page, watch some of our YouTube videos or read some of our case studies, but don’t be shy to get in touch we are always delighted to talk to care companies who are on a mission to “develop good”.